In my top dresser drawer, where no one ever looks, you’ll sometimes find a bag of Dove Dark Chocolates. I’ve learned it’s best not to keep them in the kitchen; the temptation is too close. 😉 And while I like to savor a little taste of dark chocolate from time to time, I also know how sick I’d feel if I ate the whole bag in a day! Sometimes, though, I treat life that way. I want to enjoy what makes me feel good today, without considering the long-term consequences. The future – especially eternity in heaven – often seems far away, so I focus on the pleasure in this moment. 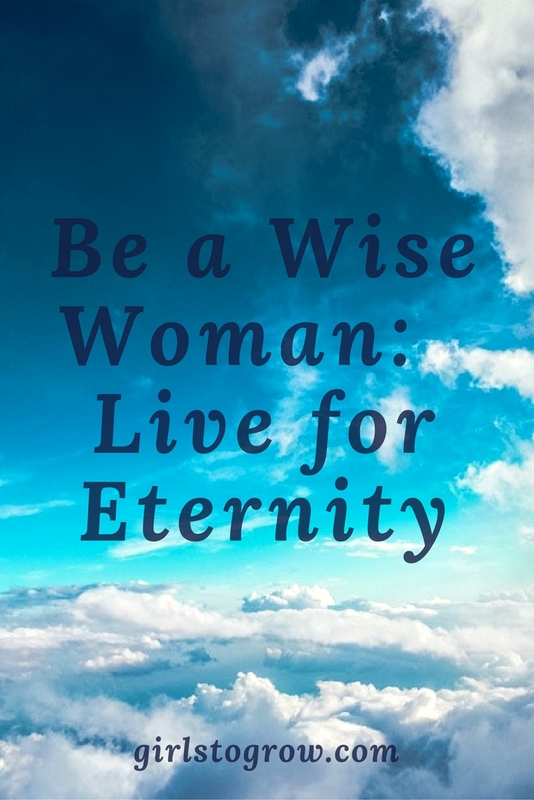 However, a truly wise woman realizes what is ahead of her, and how what she does today impacts her future with Christ. Whether it’s how I talk to my husband, parent my children, treat my neighbor, or share the gospel, the most important things I can do today are those that affect eternity. I can’t get so wrapped in my to-do list or my house projects or my television watching that I forget to invest in what lasts forever. Souls. Every person you meet has a soul that will never die. Investing in people’s lives by giving them our time, sharing with them financially, or encouraging them in some way has an impact that is eternal. We know how much Jesus loved people, and if we want to be wise, we’ll follow His example. I’m inspired by verses that remind me to keep my focus on eternal things. So how do we do live for eternity in a practical sense? Here are five ideas to get us started. 1. Read ten verses in your Bible today. 2. Choose someone to encourage today with a note, a phone call or text, or just a spoken word. 3. Christmas is coming; think of a person to whom you could give a small gift – financial or otherwise (and perhaps even anonymously) – and begin planning for it now. 4. Spend five minutes praying for a pastor, missionary, your church, or another Christian outreach ministry. 5. Communicate a truth from God’s Word to your children. Read them your life’s verse or talk to them about what we’re discussing in this post – living for eternity. Just as I’d regret scarfing down a whole bag of chocolates, I’ll be sorry to a much greater degree if I get to the end of my life and realize that I lived for earthly, rather than eternal, values. Here’s a final thought from C.S. Lewis. Thank you for visiting my site today Tracey. Such words of wisdom you share here. These are some poignant verses from God's word that remind us where our focus as Christians should be. May we make time with God and prayer a priority. We can ask for the wisdom that He is willing to give us. such a pleasure to "meet" you today. Have a fantastic week and may God bless you and yours. Oh, yes! Too many times I realize that I have wasted time on things that don't really matter, that don't matter at all in light of eternity. I love that quote from Lewis! And I like your list. Great ideas for blessing others! Yes, Tracey…these pieces of our lives need to be integrated daily, moment by moment. The joy and peace that reigns in my heart when I spend time doing these things makes such a difference in the way I interact with others, with the calm that comes over me. Thanks for encouraging me in my walk this day. I have a heart for these things, but I definitely need to be more intentional practicing them!